The Jacksonville Jaguars started their preseason off in impressive fashion, knocking off the defending Super Bowl champion New England Patriots, 31-24. 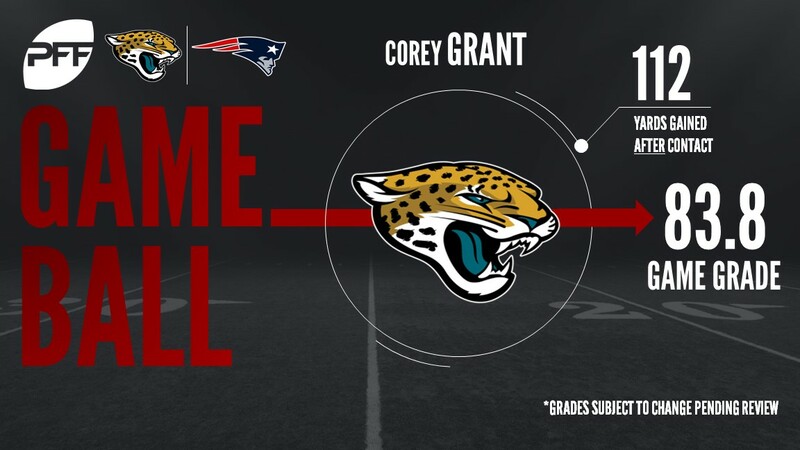 Led by an onslaught of youngsters, the Jaguars utilized some big plays, and a one-yard punch-in touchdown by rookie RB Leonard Fournette to outpace the Jimmy Garoppolo-led Patriots. Grant led the Jaguars with 120 yards rushing on 15 carries including a 79-yard touchdown run on their first play of the third quarter. Many thanks to his long run, Grant boasts a ridiculous 14.0 yards after contact per attempt average, clear and away the best of any running back with at least five attempts this preseason. Led Jacksonville’s offensive line that did not allow a single sack against Bill Belichick and the defending Super Bowl Champs. Robinson only allowed one QB hit on 13 pass block snaps for a pass block, but was arguably even more impressive in blocking for the run as he sported the game-high 86.2 run blocking grade. After missing his rookie season to injury and a lackluster sophomore pass-rushing campaign, Fowler started his 2017 season just as Jaguar fans would hope. Although he did not record a sack, Fowler did have four total pressures and earned a team-high pass-rush grade of 81.7. In a battle for the final roster spots at cornerback, Doran Grant made a good impression for the Jaguars on Thursday night. In his 18 snaps in coverage, he was only thrown at once and laid out to deflect a pass in his one opportunity to earn a coverage grade of 81.5. While the top cornerback spots are locked down for the Jags, this was an important opportunity for Grant to prove himself worthy of a roster spot. With Tom Brady sidelined for the first preseason game, the majority of offensive reps at quarterback went to Jimmy Garoppolo, who played halfway into the third quarter. Garoppolo showed good movement in the pocket and accuracy in the short and intermediate parts of the field going 18-of-21 on throws under 20 yards. When Garoppolo had a clean pocket, he had a passer rating of 119.8 and 9.4 yards per attempt. With few spots truly open for the stacked roster of the Patriots, the third tight end position on the roster was a legitimate battle going into training camp. Undrafted free agent Jacob Hollister out of Wyoming put on a great performance Thursday night to show that he is worthy of that spot. Hollister caught seven of his nine targets for 116 yards and a game-high overall grade of 87.3. Travis was one of the few who stood out on a defense that allowed over 200 rushing yards. He fielded the game’s second-highest run defense grade of 83.7. Langi registered four solo tackles and one assist in only 24 snaps, and finished with an 80.4 grade against the run, making his presence felt in Jacksonville’s backfield on multiple occasions.